Home Features The Joy of the Storm Kettle! The Joy of the Storm Kettle! Since acquiring the first of my two Storm Kettles some ten years ago I have had to decide on countless occasions whether to pack a symmetrical, compact, convenient vacuum flask or to take an extra bag containing the Storm Kettle, a bottle of water, waste paper, kindling, a cup, tea, milk and a spoon. Very roughly, I’ve taken the Thermos three times as often as the Storm Kettle, but this has been down to the nature or duration of the session – and nothing more – because freshly-made tea is undoubtedly more satisfying than tea from a flask. But the Storm Kettle accompanies me to the river-bank with greater frequency nowadays and this is very probably due to my current style of fishing. Presently, I’m less likely to spend hours thigh-deep mid-river, trotting for dace or chub or grayling; doubtless I’ll return to this but, for now, I’m into sitting back and cod-fishing for barbel or keeping my eye on a pair of pike floats. Such sessions are made for the Storm Kettle! As much as I enjoy the casual nature of these methods I cannot deny feeling a certain frustration at sitting still for lengthy periods – especially when the fishing is slow. At these times I need something mildly constructive to do and that’s when the tea-making ritual is particularly welcome. With silly, fleeting thoughts of Bear Grylls in the Alaskan outback, I split the kindling-wood with a hunting-knife and prepare the fire-bowl for action: half a sheet of scrunched newspaper, a teepee of mini-timbers and I’m ready to lower the water-filled kettle into place and strike a match. On a breezy day the kettle will quickly roar into life, spitting and crackling as the plume of blue wood-smoke lifts into the air, and within minutes the kettle is shuddering to a steamy climax. As a bonus, there’s usually a decent little fire left in the bowl to warm your hands on once the hot water has been poured into cup or teapot! Now it has to be said that preparing the Storm Kettle for consistent, effective action is something of an art and the new user will not infrequently find himself on all fours huffing and puffing into the base of the machine to set the contents aflame, but this is attributable only to his preparation. If both paper and wood are dry there should be no problem; shop-bought kindling or the oft-quoted ‘handful of twigs’ should be dry and thin enough to readily combust. You will quickly see the reason for the Storm Kettle’s reputation as a ‘volcano’ but the dark of night is when its full glory becomes evident, a tall and spectacular jet of brilliant flame shooting-up to warm both face and heart…ah! 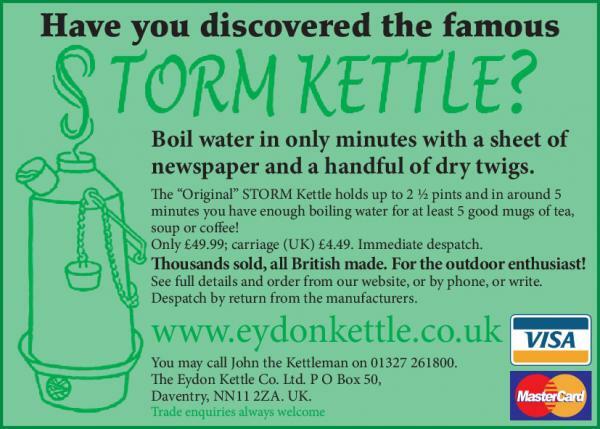 The joy of the Storm Kettle!